projects in the province for bringing native children into the regular school program. Another program started during those years were the series of parent-teacher meetings which created good school communications. Ethel was one who willingly donated time and effort to the growth of the community and watched its progress with pride. Pioneer days, carnivals, the W.1. Country Fair and being a member of the Children's Aid Society of Brandon were all part of her interests. 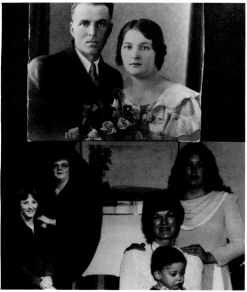 During the war years Ted was employed by Trans­ Canada Air Lines in Winnipeg so the family moved there. They returned to Erickson in 1945 when he purchased the Erickson Garage from his brother Marinus. Ted and Ethel were both enthusiastic curlers and were strong supporters of the Erickson Curling and Skating Rinks. Ted also was a chief promoter in the building of the Onanole Curling Rink. To ensure that Erickson would have a sports ground he, with some other men, purchased the triangle of land on the north end of town for that purpose. Ted and Ethel have two daughters; Rhona, born 1939, and Karen, born 1942. Both were baptized and confirmed in the Bethel Church in Danvers where Ted and Ethel had transferred membership from Immanuel and Bethlehem congregations. They attended school in Erickson. TM T~ Neilson Family. Top: Ted and Ethel. Left Insert: Rhona and Theodore. Right Insert: Karen, Kathy and Blake. employed with the Ottawa Community Credit Union. She married Winston Rogers in 1964 and they had one son, Theodore Raymond, born 1969. Since 1966 Karen has worked in the Neepawa District Memorial Hospital, first as a Nurse's Aid and currently in the Sterilization Unit. Her husband, Carman Bradley, is employed in the Neepawa Post Office. There is one daughter, Catherine. While attending school in Glad­ stone, in Grade nine, Cathy was named Female Athlete of the year of that School Division. Cathy married Brian Reimer and they have one son, Blake, born December 8, 1981. They reside in Winnipeg. Rhona and Karen have pleasant memories of their - years in Erickson, enjoying skating, tobogganing, swimming and other activities. This will always be home to them as it has been for their mother. In April 1961 Ted suffered a severe stroke and passed away in the Erickson Hospital. He is buried in the Bethel Cemetery in Danvers. Ethel moved back to Erickson where she worked in the post office for a few years until ill health caused early retirement. She now resides in the Parkland Home. Arthur third son of Daniel and Bodil Neilson, was born in 1908, shortly after the family had moved to Clanwilliam from the Lund District. He was raised on the Neilson farm near Clanwilliam with his three brothers. Arthur attended Grey School in Clanwilliam. He received his teaching certificate from the Normal School in Dauphin, and taught in several rural areas. In his first school, at 18 years of age, he taught multi-grades at Waldersee. He taught at Crocus Hill School and also thoroughly enjoyed his year at "The Little Red Schoolhouse" in Scandinavia -- a log cabin school his mother-in-law, Nellie Hall Gusdal, had attended as a child. He interspersed teaching with advanced studies, and received his B.A. in 1937 from the University of Win­ nipeg (at that time Wesley College), and attended the Winnipeg School of Art for two years to pursue his love of drawing and painting.